Irish Ferries sail between Ireland and the UK and Ireland and France. They have excellent service and comfortable ferries to make your sailing a real pleasure. Use the search below to find the best Irish Ferries fares. Irish Ferries run out of the Republic of Ireland, from Rosslare to Cherbourg and Roscoff, France, and to Pembroke, Wales. Their route from Dublin sails to Holyhead, Wales. All Irish Ferries routes can be booked securely online here. Overnight sailings leave Ireland for France from February to December. No daytime sailings are currently available and schedules can be verified when using our ferry quote and book facility. Irish Ferries to France include live onstage entertainment in the Cabaret Lounge, a family-style self-serve restaurant, restaurants with stylish waiter service, a variety of cinemas, gift shops, and late night dancing. Youngsters have their own entertainers, children’s menus, a dedicated play area and age-appropriate videos. From Dublin to Holyhead, Wales ferries leave four times daily; the trip takes 3 ¼ hours. The “Jonathan Swift” fast ferry takes the Irish Sea route covering the distance in less than 2 hours. There are plenty of interesting things to do occupy travellers’ time onboard. The Rosslare to Pembroke route has two departures daily, lasting 3 ¾ hours. Upgrades to Club Class provide greater comfort as well as magnificent sea views. Benefits include priority boarding for passengers and express boarding for motorists, reserved comfortable seating, free Wifi through state-of-the-art satellite connections, complimentary drinks, snacks and newspapers, entrée into the exclusive Lounge Bar with a range of food and drink to satisfy everyone, and a 10% discount on the best-selling items in the onboard shops. Club Class lounges on The Dublin Swift and the Isle of Inishmore are not wheelchair accessible. The Ulysses travels the route to Holyhead leaving Dublin twice daily at 02:40 05:55 and 14:10 17:25. This is the largest car ferry on the Irish Sea. When guests have finished their dining experience and taken a walking tour of the ship, they can relax in the Club Class lounge. 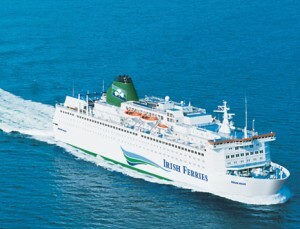 Irish Ferries’ most luxurious ship is the Oscar Wilde which sails between Rosslare and Cherbourg or Rosslare, France. It’s the most luxurious sailing ship on that route, with bright cabins, stylish lounges providing a variety of entertainment, multiple dining options, all of which enhance the comfort of overnight service. The Isle of Inishmore makes the transit between Rosslare and Pembroke. It is one of Europe’s largest and best equipped, modern car ferries. Onboard are a variety of relaxing environments where travellers enjoy the luxuries of cruising. Rosslare Ferry Port lies on the south-eastern edge of Ireland, ideally situated for travel to continental Europe. Passengers must check in one hour prior to departure. Roscoff is an ideal port leading travellers to Brittany, the west coast and southwestern France. Irish Ferries accepts pets onboard at no extra charge. Car passengers on routes from Ireland to Britain may keep the pet in their car or in one of the kennels available on the ship. Pets are not allowed on passenger decks. Kennels can be booked in advance. For hygiene and safety reasons pets cannot travel with foot passengers. Specially trained guide dogs are welcomed on board Irish Ferries. These dogs can travel on any ship in the fleet, but when travelling from Ireland to France they will need a pet passport. Guide dogs should be taken on board inside the car. The dog may then be brought up to the passenger deck for the duration of the voyage. The dogs must be on their harness at all times. Foot passengers may walk their guide dogs through the terminal onto the ship. These animals must be accompanied. Travelling to the UK or France on Irish Ferries will prove a comfortable, quality crossing for the perfect beginning of a holiday.